We continue to try to improve the content, and now the website has become a huge searchable database of well over 600 articles. When you search for your keywords using the Ixquick search box it actually searches every word of every article in PDF format, and every html page on the site. The search box is right on the front page, and the design of the website is still very simple, which is how we will keep it. It should be obvious that when we started, our traffic had to start from zero. Here are the latest statistics from our server as totaled by Statcounter.com. These statistics are for just last week from Monday through Sunday. As you can see we had 17,605 individual page loads, and 10,247 people visit the two websites for the very first time in just that week. These visitors are coming in from all around the world, including every english speaking country and many more. In October of 2015 I started an email system with automated follow up and subscription so people can get the announcements of new articles from Anna immediately when they are published to the website. Since then about 3000 people have subscribed and as of today we have 2516 subscribers that have continued to receive those email announcements. I also know from feedback from many of those subscribers that Anna's articles are being forwarded to their lists as well and the numbers are huge. We are getting correspondence from many countries, and states, and the task of sorting and forwarding, and moderating is getting to be more demanding. As you know, I also have a business to run. Lately my time to devote to that business has become a tug of war between this project and making a living. So I am asking for some help from our readers. There are several things you can do to further this project of informing the world about the fraud and criminality we have been subjected to for 150 years. 1. Continue to tell everyone you know about these two websites. www.annavonreitz.com and www.montanablog.us Do it by email. Do it in person. Do it any way that comes to mind. 2. Forward the email announcements of Anna's new articles to your friends and your entire list if you have one. 4. Get some flash drives, or DVD disks with Anna's website on them to pass around from the order page. 5. Get her books on the order page from Amazon and spread them around. Any of the products you buy through the order page help me to devote more time to the tasks of spreading the word, because you get me the time I need to do this. I just turned 69 a few days ago, and even though I have SS coming in I still need to supplement that with the business to break even every month. So far we have been managing to keep up with the bills, but they are going up as we accumulate subscribers. For example, an automated system we use for email increases their charges according to how many email addresses they are mailing for us. That cost just went up $20 per month because we passed the 2500 mark last week. We also have been able to do some paid traffic systems and are still doing them from some of the donations we got in the last few months. ONE MAN in Germany got us started by donating $2000 to our expatriation ad campaign. God bless you Hans. That allowed us to boost our outgoing ads on another system to over 25000 ads per send, which is continuing to grow at about 80 subscribers per day, but these are not subscribers to Anna's list yet. We still need to do a lot of work to get them to subscribe to get the announcements of her articles. We are continuing to advertise both websites as time allows, and your donations have made that possible so God Bless you all who have supported this work. Please consider continuing your help once in awhile. http://www.annavonreitz.com/order.html If you have not thought about what you would do in a grid down emergency situation for communications you can find much information on this blog. Just type emergency communications, or radio communications in the search box. Beyond that I would be happy to answer your questions at 800 889 2839 about radio, and all the information you require to be an effective communicator. When you get the message just press zero and the system will go find me. 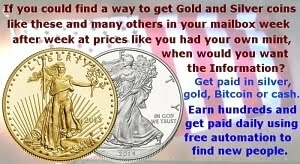 The last thing I will mention is that part of our business is to help people preserve their wealth through hard times, so we are in the precious metals business, and this has helped us build the websites and bought us some time to devote to this work. Our silver offerings are at this link. http://www.teapartysilver.com/silverforsale.html Call me to order. We have a sliding scale that works according to volume for bigger discounts, and we have some divisible rounds that will help you make change when the silver price goes up. Again please call me and ask questions about how this works. We have helped hundreds of people this way over the last nine years. Thanks for your help and God Bless you and yours'. I have some of the flags on my list. Will try to help more as well, your work is such a blessing getting Anna's work out to us all and keeping the site up, simple and for us. I read on Michigan Assembly site about the flags, very detailed about the customs house, the early use of the flags, the fact of these flags is recorded not just some opinion or idea. 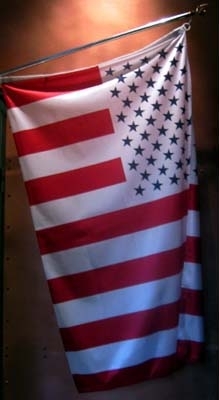 These are the peaceful flags of the States of America, the united peoples of the land. You said this well. The "Peace Flag" is a good way to put it. That flag, in my mind, is the demarcation between the jurisdiction of the sea, and the jurisdiction of the land. When people come on shore, they used to see that flag, and they should have realized they were on the land at law. God bless you all for your hard and dedicated work, assisting your brothers & sisters through these difficult criminal times..
Hi Paul - YOU are on SS!!! Having access to Anna like you do, why on earth are you not on the US, INC RETIREMENT? I just know that YOU are not a US Citizen, and Anna says that the only people who are supposed to get SS are US Citizens. Of course, this is totally and completely none of my business, I realize that, but any comments you might have as to why you, of all people are still on SS, would be interesting to say the least. I would have thought that YOU would have been among the FIRST people to expatriate out of US INC, and again - this is totally none of my business, and please feel completely free to ignore my curiosity, but if YOU are still on SS, knowing Anna like I think you do, I'm just thinking ... what hope do the rest of us have to get off of it, and get on to the RETIREMENT from US, Inc that Judge Anna explained in some of her latest writings, and again, feel completely free to just completely ignore my "nosiness" if you so wish. If you would show me how to get my hands on my 50 year investment that these criminal masterminds of the fraud stole from me by assumption and presumption in the form of payments by myself and my employers to the SS fund I would be happy to tell them to keep their monthly payments. I can do a much better job of taking care of my retirement and growing my money than they can, even in this terrible economy. It's one thing to expatriate. That won't stop the payments. It's quite another to get our hands on the investment capital that is owed to us in the first place. What do you think Anna is working on, if it's not laying the axe to the root of the evil tree, and solving this problem for everyone, instead of trying to solve it one case at a time in the corrupt and evil corporate tribunals that belong lock, stock and barrel to the enemies of America. Annonymous0210...are you sure you have been reading judge Annas articles. Even if we expatraite out of the Corp. United States, no one has suggested that we just walk away from SS because we all worked hard for it. It is only a fraction of what they really owe us. And until they return everything we are really owed, because of the theft they have cleverly disguised as lawful, which by the way is in the Hundreds of trillions, we are still owed at the very least our own SS. Most of us in this movement have only our SS to live on because we are basically honest people. Rich people love this system and could care less about the things we talk about on this site, because they have learned how to make it work for them, not realizing that it is all an illusion and that we are reaching a point where those same people are going to find out that they never owned anything and when this monitary system reaches critical mass, they will simply close all bank accounts and take everything from them. But no one on this site has ever claimed that we dont deserve what we already worked and contracted for, especially since everything they had us paying into was done under the presumption that we were all required to do it by everyone...teachers, accountants, Attorneys and judges. Hell, even our own parents. Until they make us whole again, by giving everything back they stole through fraud, SS is the only thing they wont argue about because they promissed it to us. When we look for real remedy in the courts, we never get it. All the "forecloseures" that have taken place since 2008 are all fraudulent, even to this day. And the banks have already been bailed out of their mess to the tune of $2 trillion which together with credit default swaps and TARP funds, have been paid in full for all those morgtages. And now they still want to foreclose on peoples homes so they can even make more. And our courts are still letting them get away with it. If this was an honest system in a fair world we should all be rich. But , instead, they want to turn America into a third world country, now that they are done with it. And the only reason we arent is because something happened that the "elitist" of the world never planned or expected.....the election of Donald Trump. If Hillary got in, America would have already collasped. Judge Annas lien on the BANKS and Federal Reserve is only for "discharging" the rest of our debts only. It is not set up as a bank we can simply "draw down " on to buy anything we want. Its only for "closure and set off" from outstanding debts. But its the BANKS that owe us the rest. But they are going to be defiant to the end. We will never see that money....ever.!!! Thats why we not only need but legally deserve for being good Corp. slaves for the last 60 years. Thanks James. You said this better than I could. Well if i cant give, at least i can offer a hand on this site once in awhile. But if i could, you know i would. When i think about the money i was conned out of by complete losers who did nothing good with it, it would have given you guys enough to live on the rest of your lives and this site. My advice to everyone on this site is to get as far away from negative, unhappy people no matter who they are. If i would have done that years ago i wouldnt be in this position. Its impossible to make good choices in life around people who walk around with a chip on their shoulder all day long. There isnt anything you can do for these people except pray. But you cant live with them. They will take you down, before you can bring them up...your wecome Paul.